Has anyone asked themselves what the point of media is in the cryptocurrency sector? Look around. All you will see is the same stories repeated over and over. Someone influential will come out against cryptocurrencies or an exchange will be hacked, and Bitcoin prices fluctuate in response. Next thing you know, another influential person tells people cryptocurrency is the future, and the market reacts once again. This cycle is almost guaranteed to happen every month. So, what is happening because of that? We are overloaded with news and predictions that are so diluted with noise that everyone is trying to stand out and be that one source that gets everything right. You want price predictions without justification? They are everywhere, and every single one of them claims to be the most accurate but never show why or how. 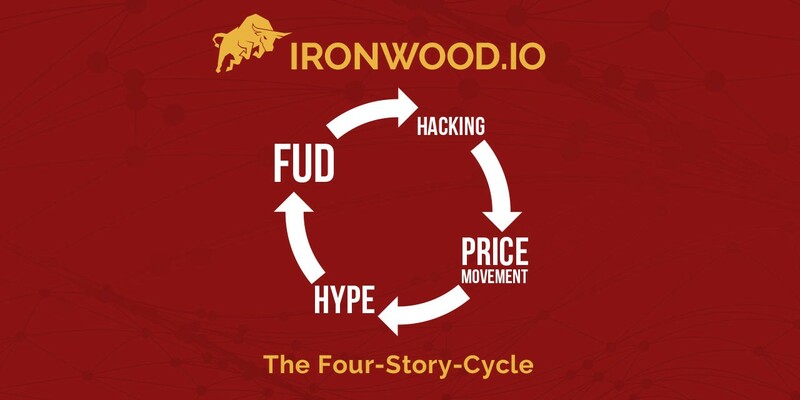 Most of the time, they are just spreading FUD, or worse, the hype that reversals are coming. On the off chance, they do call that one major reversal, they are labeled crypto geniuses. It doesn’t matter how many calls they got wrong or the number of people who lost to their bets. The point is that “news” sites for cryptocurrency are acting irresponsibly just so that they can sell their audience, and often times, just placating them. After all, how else would an ad-paid website generate revenue if they did not post overhyped click-bait? Signal groups act the same way by calling every little thing they can manage while over-hyping price points. It’s a classic tactic used in all sectors of advertising, and unsurprisingly, it works. Let’s take a closer look at the four-story-cycle. 1. Warren Buffett and Jamie Diamon expressed severe doubt on cryptocurrency (FUD). 2. South Korean exchange Bithumb was hacked for $30 million worth of cryptocurrencies (Hacking). 3. Bitcoin fell from $7520 to $6218 USD (Price Movement). 4. CEO of BKCM Brian Kelly supported crypto on CNBC (Hype). 1. CFTC chairman J. Christoper Giancarlo stated he does not believe Bitcoin to be an “ideal” payment system (FUD). 2. 51% hack on Verge cryptocurrency (Hacking). 3. Bitcoin fell from $9240 to $7485 (Price Movement). 4. Reddit Co-Founder Alexis Ohanian predicts Ethereum will reach $15,000 USD (Hype). Websites will take advantage of this cycle and spin any story they want depending on their audience. 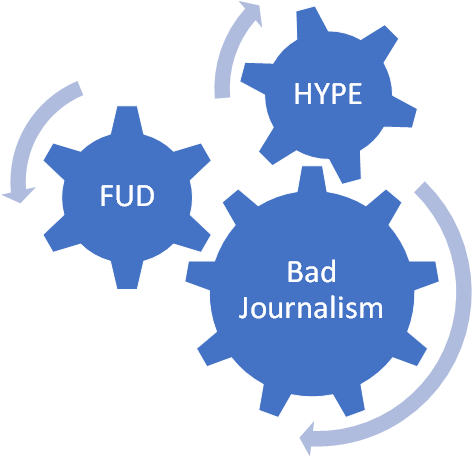 It is very easy to target FUD and hype when it predictably follows this cycle. This drives news outlets and signal groups to use this to their advantage by creating click-bait worthy articles and over-hyped indicators. It is a dangerous and vicious cycle to fall victim to, so always be sure to do your due diligence. Author disclaimer: I am a lead researcher at Ironwood Research Group. We are a subscription-based news, signals, and education group that strives to clear the turbid waters of cryptocurrency. We value the subscription model because we believe selling ads encourages bad journalism. We focus on providing quality content and maintaining integrity for our audience instead of selling our audience to advertisers or by just providing people with what they want to hear, potentially entrapping them in moves that are based on no substance.